I've been watching this Hi Top and bidding seems to be unusually strong. Especially for the missing front wood base. It's a quarter machine and appears to be unmolested. Another thing that baffles me with the bidding on ebay is why do people bid with days left and not at the last minute? Other than a 1st bid so they dont pull it, why increase the bid with days left on an item? This seems high to me on this slot. 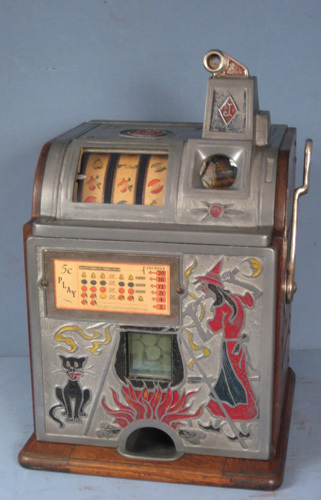 Dead ringer for my machine except for the single cherry payout. It is also missing the jackpot trip lever in addition to jackpot push bar. Jackpot will not work in that condition. Not complete and unmolested as stated.